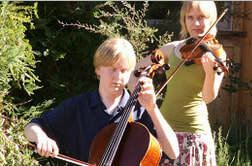 Award-winning musicians Laura and Darin Smith are a brother/sister duo who have been performing together on fiddle, cello and tenor guitar for many years. I met them when they played in both the Ukiah Symphony Orchestra and the Lake County Symphony as kids. I composed this duet for them in 2008... before they both went off into the big wide world. They never got to perform the duet together. The duet is in two movements: Darin's Got a Cello, and Letter to Laura. Darin's Got a Cello is for Darin, who impressed me as a fabulous, smart young cellist. He now works with the U.S. government as a computer expert. Letter to Laura is a musical letter to Laura about what it will be like for her to leave this rural area in Northern California and get out into the big wide world. Click on the "Buy Now" button below to purchase parts for "Duet for Laura and Darin" for $2.50. Payments are made to "NeoCentris, LLC". Once your payment is verified, click on the "Return to Neocentris L.L.C." link and you will be taken back to the "Jazzical Music" page where you can print or download parts for "After the Rain".